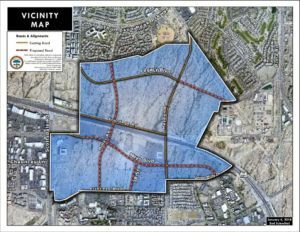 There is a high-profile section of land along the 101 freeway in Scottsdale that will be the site of future development. Approximately 1,000 acres of undeveloped desert land known as Crossroads East lies east of Hayden Road to Scottsdale Road, just north and south of the 101. The area has recently been rezoned to allow nearly 7,000 residential units, industrial development, hotels and office space. In early September, Nationwide Mutual Insurance Company acquired 136 acres of the land for its new regional headquarters and other development. The Nationwide development is expected to employ 5,500 people and would add an annual $500,000 impact to the Scottsdale economy with direct revenues to Scottsdale estimated to be $24 million over 20 years. Along with the 1 million square feet of office space, Nationwide will be developing two hotels, 50,000 to 200,000 feet of retail space and 1,200 to 1,600 residential units. Construction is scheduled to begin in 2019. The tallest buildings in the Nationwide development, expected to be roughly 10 stories high, will front the freeway and then the height of the buildings will get lower as the development spreads north to the Grayhawk subdivision. With the expected increase in traffic, the city will be constructing a Miller Road underpass and an extension of the road to Princess Boulevard. There will also be a widening of Hayden Road to six lanes. The widening is scheduled to be completed by 2020 and the Miller Road extension to be completed by 2021. As residential housing opportunities become available, we’ll keep you posted on the impact those units, and the high-wage employees that will need housing, will have on North Scottsdale real estate.